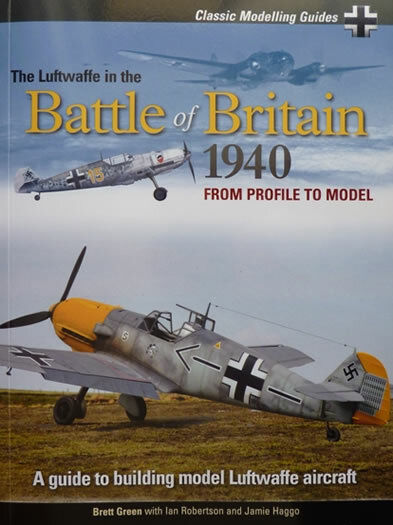 Advantages: Authored by accomplished modellers; well laid out illustrative approach to each subject; varied range of aircraft and scales; large format images; inspirational artwork; informative text. Conclusion: This book takes a practical approach to a process that model builders have been using for decades. Via large colour step-by-step images, the reader is taken through the logical steps to complete a kit from “Profile to Model”. With additional period photographs for reference, and instructive advice from authors, the modeller is shown an assorted range of techniques to achieve their goal. 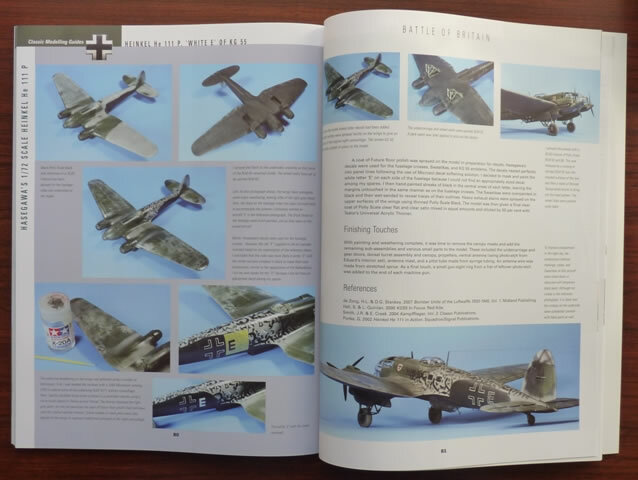 The Battle of Britain continues to fascinate aircraft modellers. Not only is this due to the importance of the conflict, but also to the colourful nature of the aircraft involved. 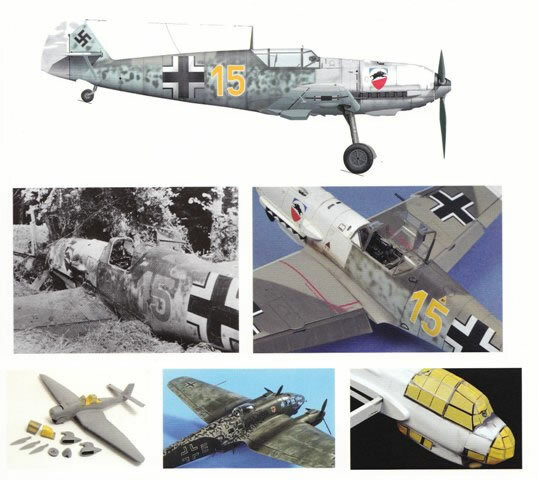 We are of course talking about the Luftwaffe, whose ever evolving official and non-official camouflage schemes have proved to be a challenge amongst enthusiasts. 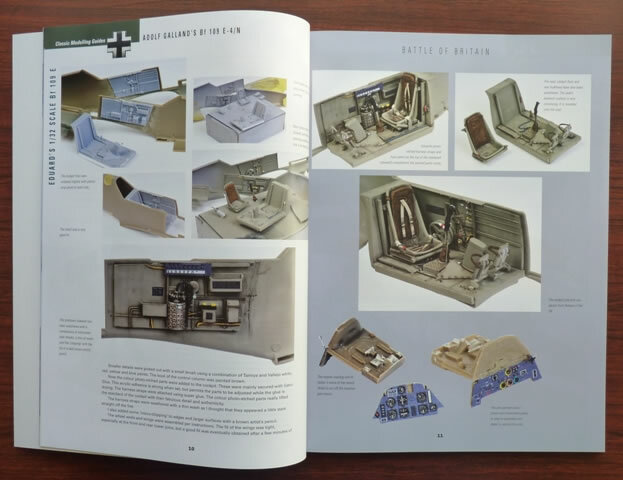 With the 70th anniversary of the Battle of Britain upon us, it seems only appropriate that a modelling guide appears to commemorate the event. This visual reference comprises of 96 pages between the soft card covers. The format is slightly larger than A4 which allows for each image to be reproduced as large as possible. This permits maximum detail to be gleaned by the viewer. There are well over 250 colour images covering the various stages of construction. 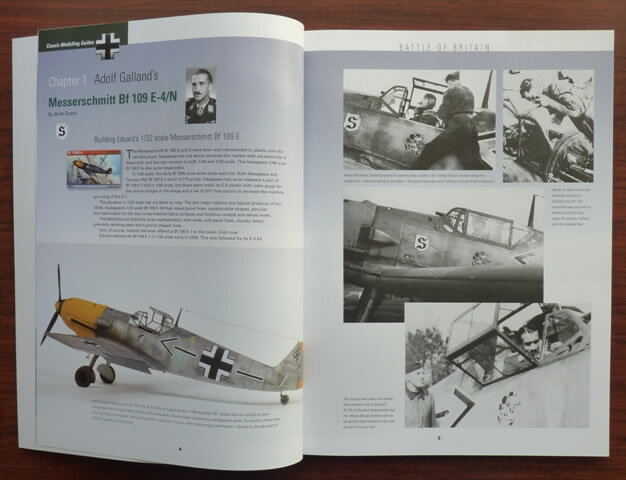 These are complimented by 30 period photographs of the aircraft in question, and 7 pages of artwork. Often it’s a particular colour profile that starts the heart racing when looking for a subject to build. Then one sets about looking for reference photos to either confirm the livery or put the aircraft into its proper context. When armed with this information it’s time to plan and start construction of the kit. This book follows precisely that procedure with the added bonus of providing helpful hints and tips along the way. After a brief synopsis of the Battle of Britain, the reader is introduced to 7 models representing 5 of the main combat types. Three different authors take part in the completion of these kits and they are all accomplished modellers in their own rite. The advantage of having a variety of contributors is that a number of different approaches can be conveyed to the reader. All of the subjects are enhanced with after-market parts in one way or another. Some are photo-etched, others are in resin, but they all allow ample scope for each builder to show their techniques. This first chapter is typical of the others that follow. The author selects a subject and then presents a logical step-by-step process that culminates in an accomplished example of the original aircraft. In this case, Eduard’s 1/32 scale offering is the starting point. Inspired by a superb colour profile and numerous period shots of Galland’s steed...the task begins. 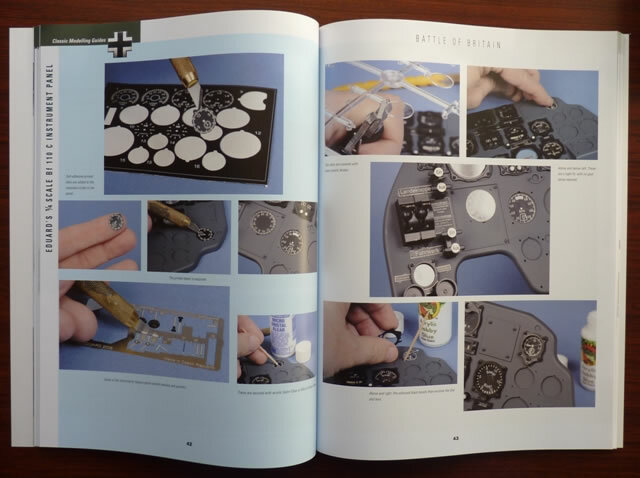 Accuracy, construction, painting, markings and weathering are all discussed in the text and are complimented by clear photos of the procedure. The latter are in colour and their clarity leaves very little to the imagination. The early career of Galland is also presented which adds a “human” touch to the subject. Enhancements used – Cutting Edge resin cockpit. Messerschmitt Bf 109 E-3, Yellow 15” of 3./JG 52 by Brett Green. Enhancements used - Aires multimedia cockpit set and Ultracast resin accessories. Messerschmitt Bf 110 C,”M8+DP” of II./ZG 76 by Ian Robertson. Enhancements used - Quickboost’s replacement slats, wheels, and exhausts. 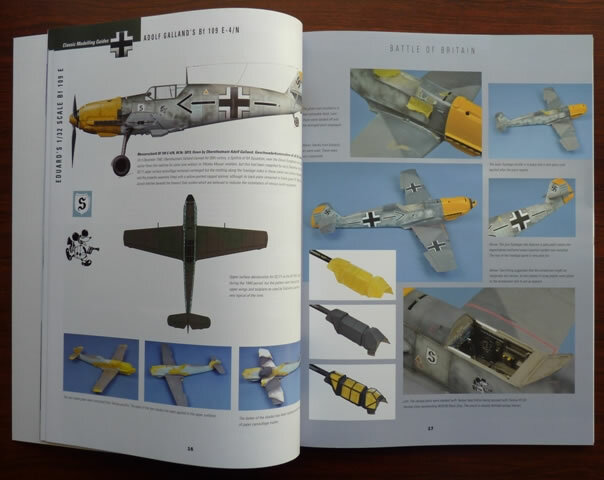 Also included is a section on building Eduard’s ¼ scale Bf 110 instrument panel by Brett Green. Enhancements used - An Errata list to correct the problems found on the instruction sheet in the Dragon kit. Enhancements used - True Details wheels, Eduard photo-etched parts. Kit used - Hasegawa 1:72 scale Heinkel He 111. Enhancements used - Eduard photo-etched interior detail set and canopy masks. Kit used - Revell 1:32 scale Junkers Ju 88 A-1. Enhancements used - MDC photo-etch harness straps. By utilizing kits in different scales and having contributions by different authors, the reader gets a real cross- section of techniques to take under their wing. The work of each participant provides plenty of inspiration and when this is coupled to the wonderful colour profiles and informative text, one can’t help running to the “stash” to see what kits are on offer. The “Profile to Model” idea is an excellent one and modellers of all skill levels will appreciate this publication.